Clever man. Here's your dollar. 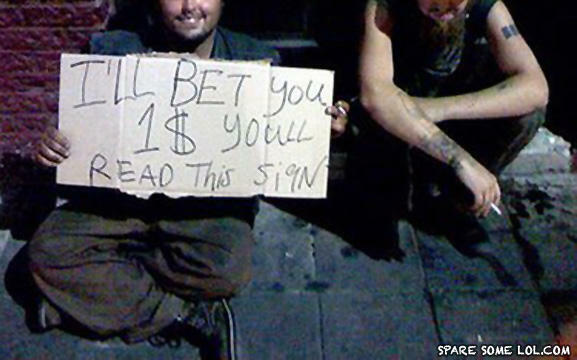 Moral: What a smart guy, I bet you ten dollars I did not read the sign. Damn! I just blew my cover Here you go. Brilliant. What's this man doing on the streets?! I heard this guy held 95% of ENRON stock. dam! i so thought id win that bet! AVOID READING ALL SIGNS CAME FROM NOWHERE AT ALL COSTS! why did the baby start crying? I AM FAGNETO! WELCOME TO GAY! "This car is about as well equipped as a pair of Monk's underpants."